Buddy is a two-year-old Golden Retriever who jumps up on people, gets over excited when children are playing nearby and plays too rough at times. Knowing he liked to jump up, I projected a confident and assertive energy and kept the dog in front of me at all times. This temporarily stopped him from jumping up as he came in to give me a good sniff. But once he finished, he did try jumping up so I moved to disagree and block it. This caught Buddy by surprise which caused his energy to drop a bit as he gave me more space. 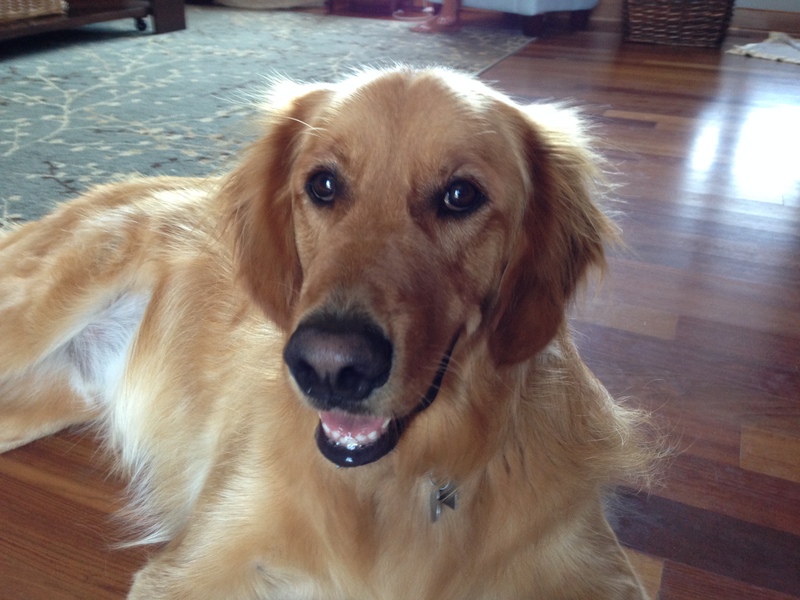 I could tell the dog had a nice playful energy which is pretty common for a Golden. When his guardian and I sat down to discuss Buddy’s issues, I quickly detected a common theme. All the real behavior issues she described occurred when the dog was excited; guest arriving, kids running and making noise, etc. The rest of the time she said he was almost the perfect dog. I did notice that he was a little clingy, sitting so that he was touching her and following her when she got up. She said that was an unusual behavior for Buddy. Its possible that he was acting differently due to my arrival as I didn’t engage with him and blocked him from trying to jump up. I called him over to get some easy and positive interaction with him before getting started. Buddy came over right away and I tried to use a hand movement to put him into a sit a foot or so away from me. Space equals respect in some situations and while I wanted to start off our interactions in a playful way, I wanted to make sure the dog respected me. Buddy sat down about a foot in front of me and I started to scratch him under his chin while I repeated the command word. But after a few seconds Buddy laid down on the floor and rolled over exposing his stomach to me. While its common for dogs to roll over and expose their belly to their guardians and trusted friends, doing it so quickly to a stranger is not. I interpreted it as the dog submitting completely which wasn’t what I wanted. I immediately stopped petting Buddy and used another hand movement to get him back into a sit. I suggested that his guardian and family do the same. It was almost as if the dog felt that if he wasn’t the top dog, he needed to be the absolute bottom. This behavior can actually trigger dominance in some dogs and is just not the behavior or social interaction I wanted him to be engaging in in this situation. I decided to use a leadership exercise to help condition Buddy to surrendering in a less submissive way. I laid a strongly scented meat treat on the floor and claimed it as another dog would. When buddy tried to get it, I moved forward to block him. When he stayed in place or moved back, I took a step back. When he sat down to say he wasn’t challenging as much, I took a big step back. When he laid down to say he understood he wasn’t going to get the treat, I turned to the side and tapped the floor to let him have it. I wanted the dog to understand that arguing with me or attempting to bypass my authority will be constantly blocked while surrendering is actually rewarded. And in this case, the surrender was laying down, not laying down and exposing his belly. I ran through the exercise a couple times then coached his guardian through it until she got the same result. Shortly after we finished that exercise, other members of Buddy’s family came home. Charging the door was one of the issues Buddy’s guardians wanted to stop. As soon as Buddy saw them he bolted over to the door. I had prepped his primary guardian on how to block him, but Buddy beat her to the door. His guardian successfully used a correction I had given, stopping and settling Buddy down, but then he rolled over on his back turtling up. While his energy was low at that point, he was laying in the middle of the crowd of guests who just arrived. I tried to walk her through a few techniques to move the dog away to make sure his energy stayed low, but his constant “turtling up” make it difficult. Because Buddy didn’t always listen to the family’s preteen children, I walked them through a simple recall exercise. I included a hand motion to the end of the movement to put the dog into a sit in front of whoever called him. At first Buddy was a little inconstant, but after a couple minutes he started to get it, listening and obeying to whoever called him right away. I suggested that his guardians practice these exercises daily for the next week or two and how to make them more challenging. By developing these skills, Buddy will learn new commands while also developing his ability to show self control and restraint. I also suggested that his guardians not pet the dog when they arrive unless he is completely calm. While this sounds like a trivial thing, this action is directly related to his excitement at the door. They were literally training Buddy to get excited and jump up on them because each time he did, they petted him. Stopping the attention is one of the most effective thing the family can do to help the dog learn a new way of behaving when they arrive. Once he is calm and sitting, then they can pet him while repeating the command word for sit. This way, Buddy will change his behavior and start sitting in front of humans when he wants to get their attention. Next we went into the basement so the kids could play and roughhouse so I could see how Buddy interacted with them. A few minutes in, Buddy’s guardian mentioned he wasn’t acting like he normally does. Another example of how quickly dogs can change once we start leading them in a way they understand and respect. After going through a few things, I finally saw Buddy start to get overexcited when the kids were playing with a ball. But the second I recognized this I made a sound to correct him which pretty much stopped him from any further attempts. I explained to his guardian that she will need to disagree with him the same way in the future. The real secret to why one correction was so effective was the timing. I disagreed the second Buddy started to get excited which took all the wind out of those sails. Next we went outside and I saw a stronger reaction from Buddy when the kids got loud running around him waving a towel. I disagreed again the same way, but this time I was a little late and Buddy was further away so it took a second correction to get him to stop. I suggested to the kids that as soon as Buddy started to get excited and jump up or nip them that they immediately stop playing and stand tall with their arms folded over their chests. When we practiced this technique, it took Buddy a second to settle down, but once he did he stopped completely. It will take a combination of both methods and timely corrections delivered on a consistent basis for a week or so before Buddy stops trying to play so rough with the kids. In time these will teach Buddy that in order to be abel to play, he can’t get too excited otherwise play stops. After going back inside and working on a few additional things, we went over a new way to feed Buddy. Asking Buddy to wait before eating is another way that we can help him practice self control. By the end of the session, Buddy’s guardians were commenting on how impressed they were with the changes in his behavior. Because the dog really wants to please his family, these issues weren’t too difficult to deal with. If everyone stops petting or playing with the dog when he gets too excited, Buddy will stop getting too excited to control himself.